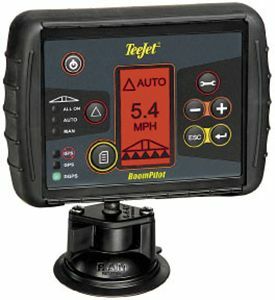 TeeJet BoomPilot is a quick and easy addition to almost any lightbar guidance system. Leverage your GPS guidance investment by adding BoomPilot and take advantage of the latest in sprayer automation. With the GPS data provided by your existing guidance system, BoomPilot will automatically switch off sprayer boom sections when they enter a previously applied area. BoomPilot records the GPS location of the applied areas in your field. When a section of your sprayer boom overlaps one of these areas, that section is switched off automatically, and then switched back on when it re-enters an unapplied area. This automation is useful on point rows, on curved rows, and even at the end of each pass. Reduced overlap saves on material inputs, fuel and time, and operator stress.